When it comes to changing hand with the ken (from right hand to left hand) one is facing a difficulty as the Chinese blade is heavier than the Japanese regular Katana. It also has a different balance, the weight being more in the head of the blade. 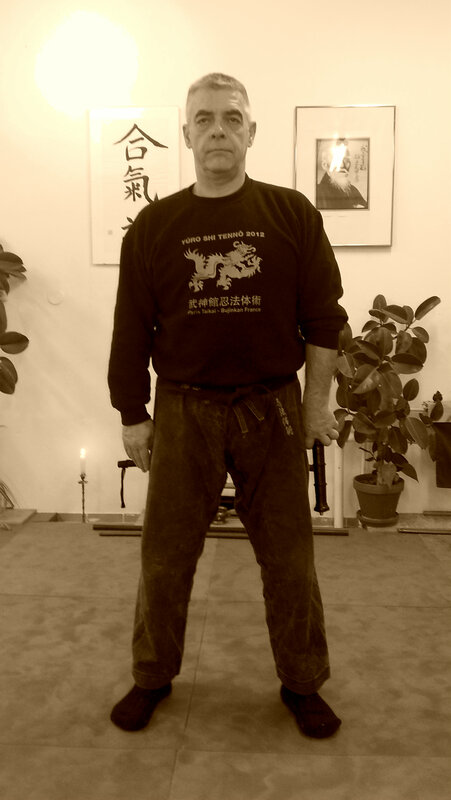 Changing hands is not very common in traditional swordmanship in Japan but it is in the bujinkan and in China too. The positioning of the fingers on the Tsuba of the Ken allows to orient the blade properly in the movements and this is what we need in order to change our grip from one hand to another. Below is a pictured example on how to proceed. 1. Start from a sort of Shizen/Hira no Kamae. 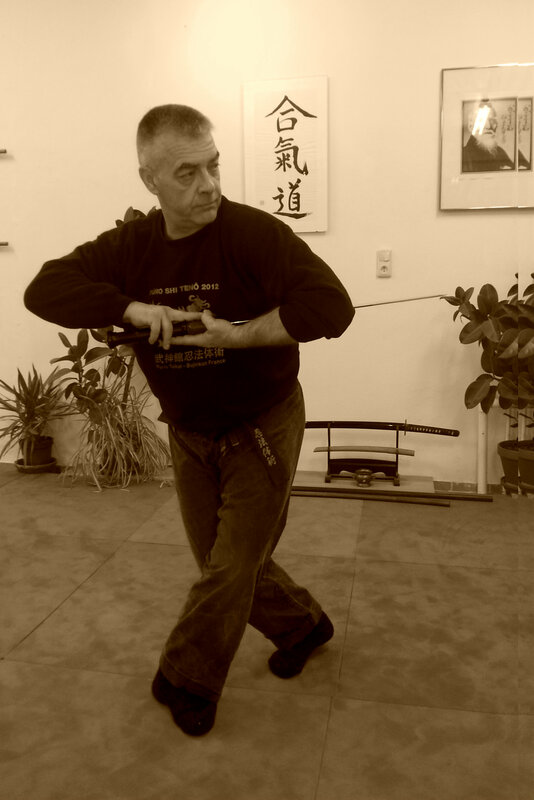 The sword is held reverse (kashira to the ground). The blade is hidden behind the back. Knees and arms are relaxed. Gravity is holding the sword in place. The left leg passes in front of the right leg. The body is going backwards. Keep your balance. The hands are on both sides of the Tsuka. Watch the positioning of the fingers on the Tsuka. Legs and arms move simultaneously. 3. Uncross the legs while pivoting towards the attacker. While the right hand is rotating the blade. Sword is flat, palm is up. 4. 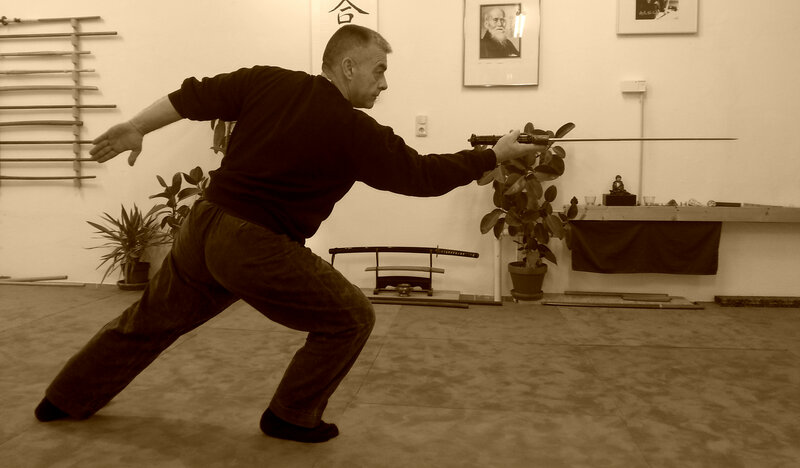 Thrust the blade forward with a full body movement. The left arm is helping the thrust and pulls backward extending the body. This is some kind of Hira Ichimonji no kamae. Be strong and balanced on your legs. Push on your back leg. You can pivot on the rear toes to add more distance to your thrust. 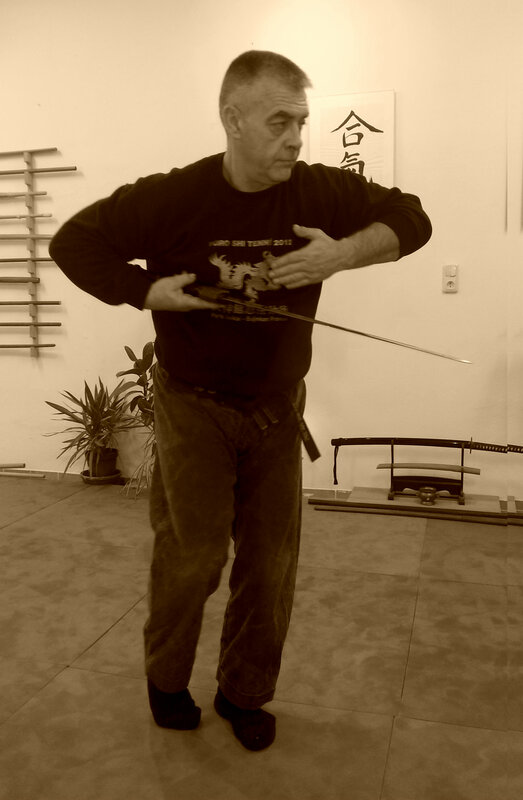 The blade is horizontal and facing the opponent at all time from the beginning of the change of hand. 左右 sayû means left/right but written 矢優, sayû becomes a “skilled arrow” piercing the defense of the attacker. Next Post How To Get It?